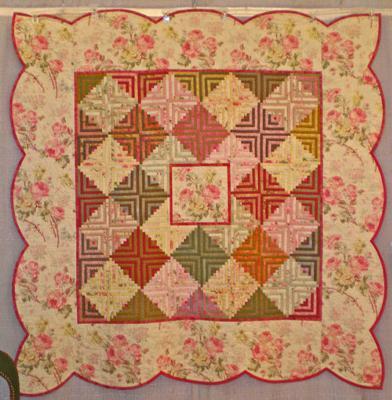 "My favorite fabric, the large floral print, and favorite block, log cabin, are the impetus for this quilt. The 1/2" logs are paper-pieced and machine quilted. The medallion center and scalloped border are hand quilted." This is such a pretty quilt! I love how Jackie has used alternating strips in her log cabin blocks for visual depth. And the scalloped edge is just the perfect finishing touch. And this quilt is SWEET!